In 2014 the installation ‘Blood Swept Lands and Seas of Red’ was in place at the Tower of London. It seemed to capture the popular imagination in a powerful way. Created by artist Paul Cummins and designed by Tom Piper 888,246 ceramic poppies cascaded out of the Tower of London to progressively fill the moat. Each poppy represented a British military fatality in the First World War. 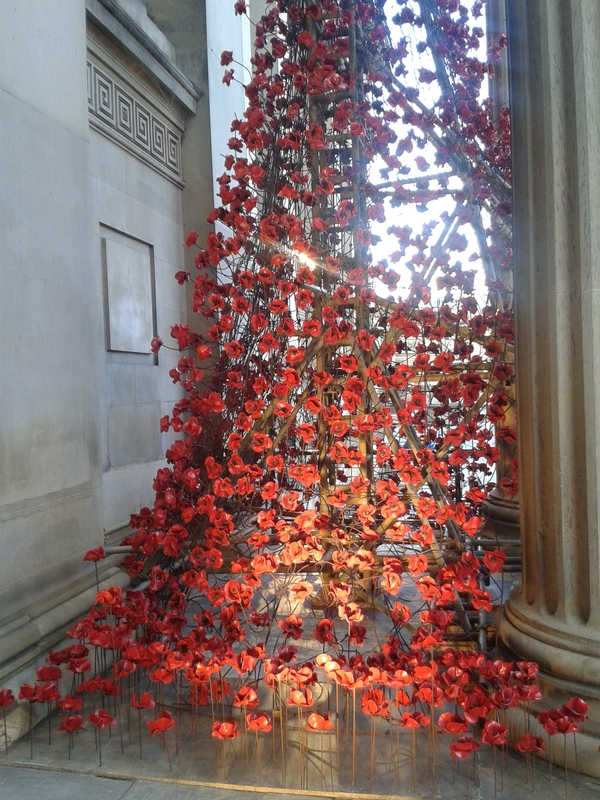 It is interesting how art and remembrance could combine so effectively in people’s minds and the poppies from the installation have continued to be used in different ways around the country since, part of the installation moving to St George’s Hall in Liverpool in November. 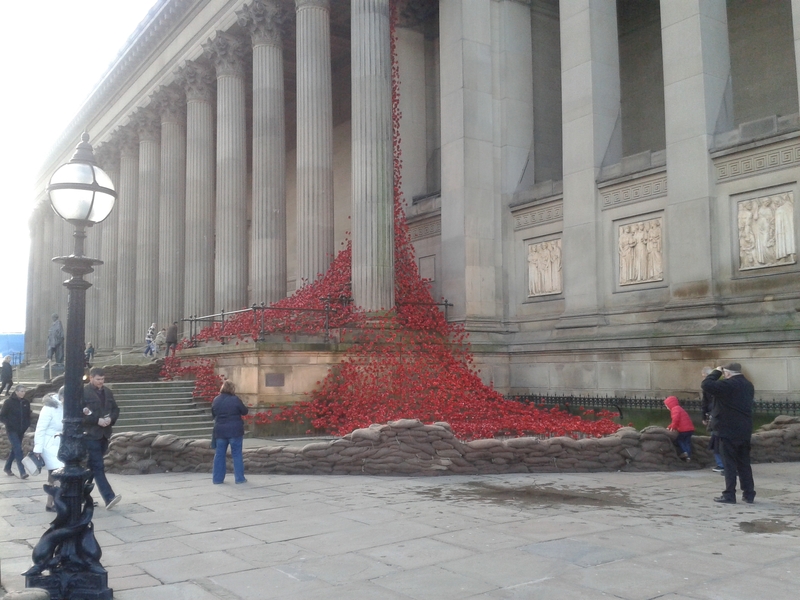 I was fortunate to be able to see the ‘Weeping Windows’ installation in Liverpool shortly before it ended on 17th January 2016. 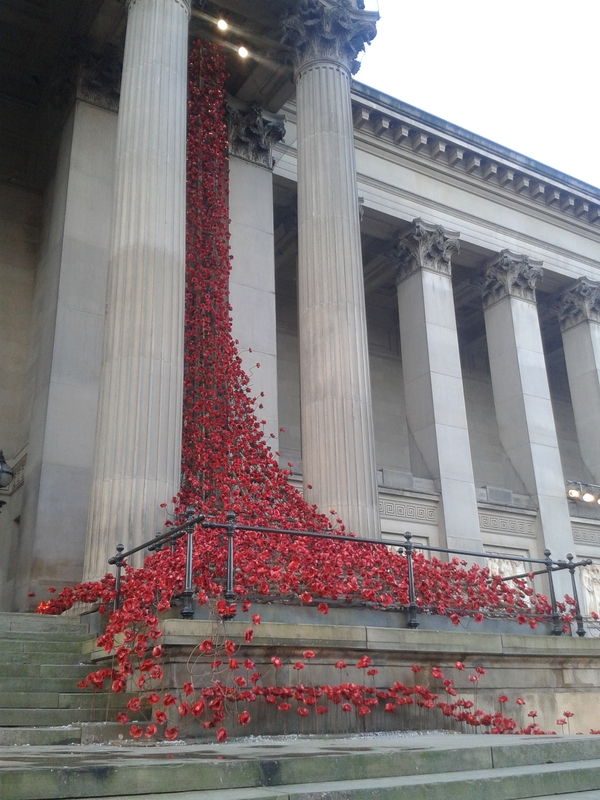 Several thousand poppies poured from a high vantage point in the Hall on to the ground below. 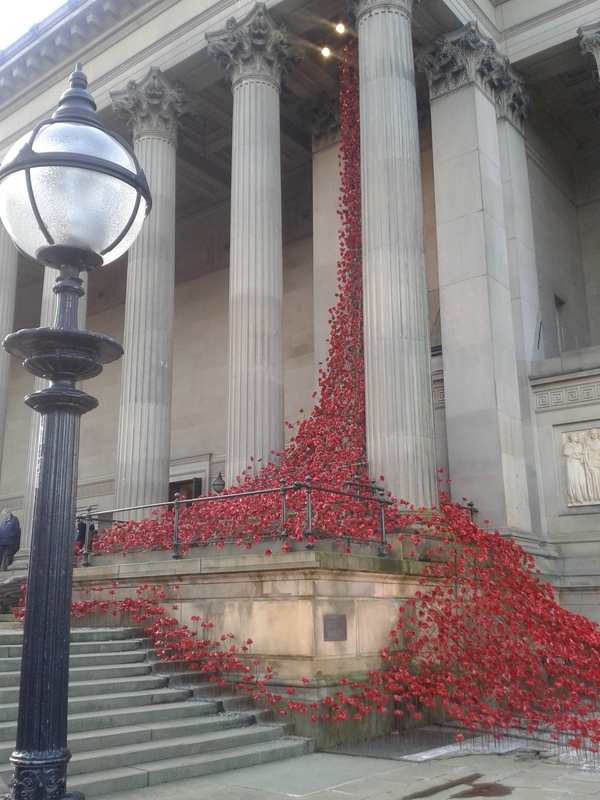 As such a significant building St George’s Hall made a magnificent backdrop for the poppies and over 300,000 visitors are estimated to have travelled to see it in place. 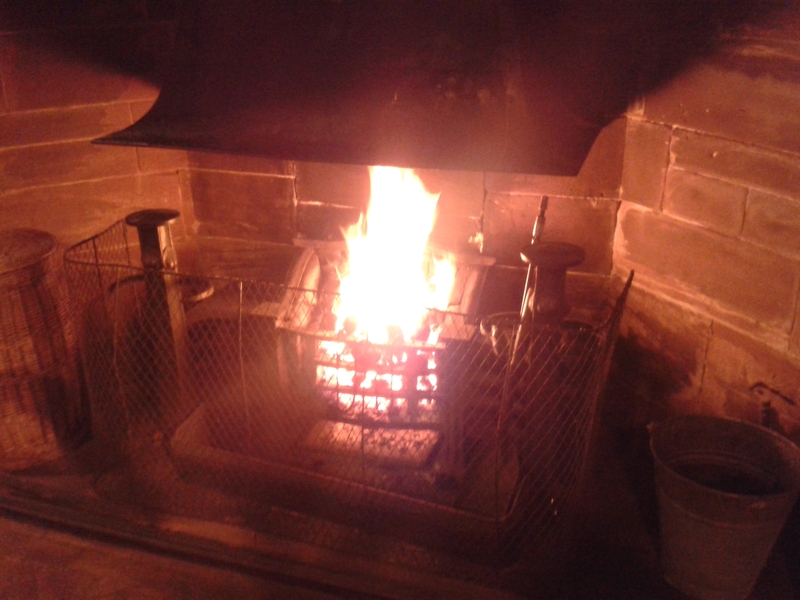 As the notice at the installation made clear this was a particularly appropriate venue for such a display. The plateau outside St George’s Hall became the rallying point for the men who formed the Liverpool Pals under the direction of Lord Derby in the First World War. In March 1915 Lord Kitchener inspected nine battalions of Liverpool Pals formed up outside the Hall, local men who had volunteered to serve together. In the years after the First World War the memorial for the dead of the city was placed outside the Hall and near here the installation was placed. Altogether a moving and impressive display. The building of Chowbent Chapel in 1722 speaks volumes for the determination of Lancastrian dissent in the early eighteenth century. Having retained possession of the chapel of ease after the ejections of 1662 it wasn’t until the 1720s that the local landlord managed to expel dissenters from the essentially Anglican chapel, allegedly because of the part played by the minister ‘General’ James Wood and his congregation in suppressing the Jacobite rebellion of 1715. 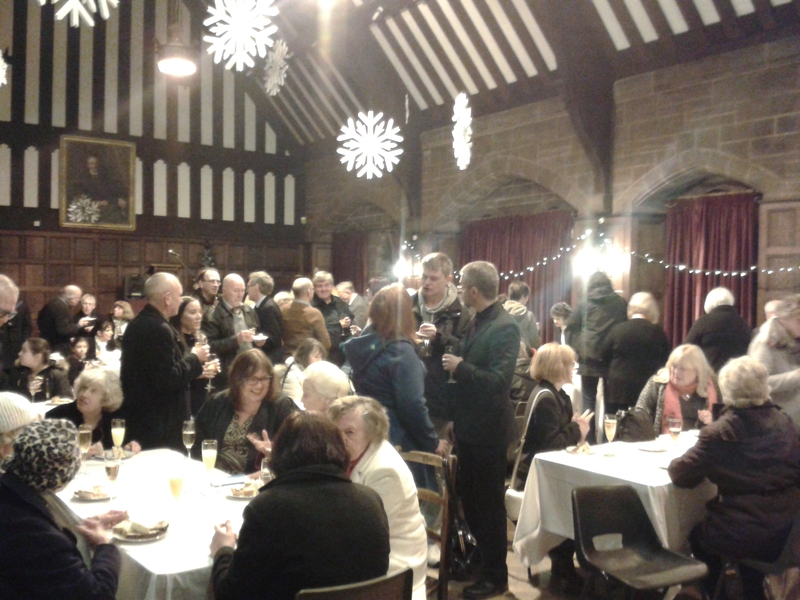 The new chapel was built on land owned by the Mort family who appear to have been generous supporters and benefactors and who had a great importance in Lancashire non-conformity in general. But the chapel, to me at least, always has something of the sense of a fortress about it – the solid, square walls, the ancient oak pillars, the studded door into the church, the large memorial to ‘General’ Wood above the pulpit. But it is also full of interesting details that would be easy to miss. 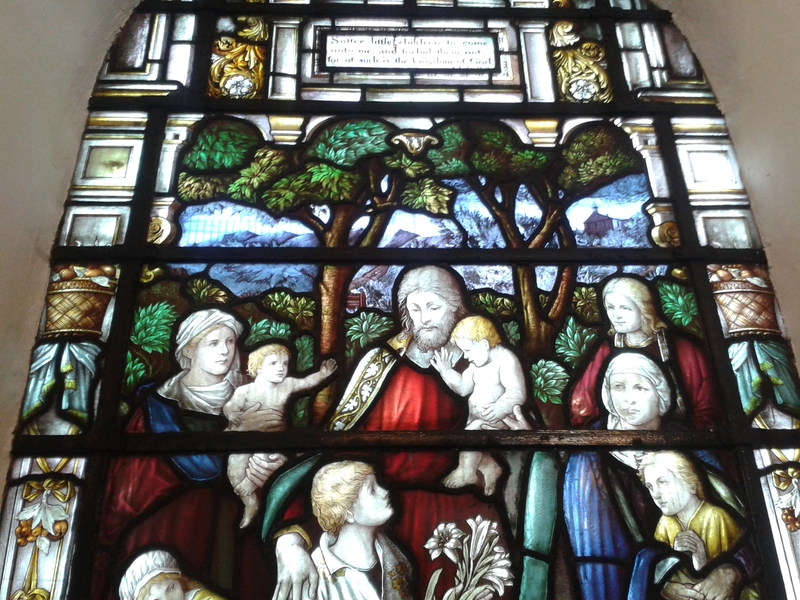 There is a large amount of stained glass but I had forgotten about the appearance of an image of the chapel itself in the window depicting Jesus and the children. 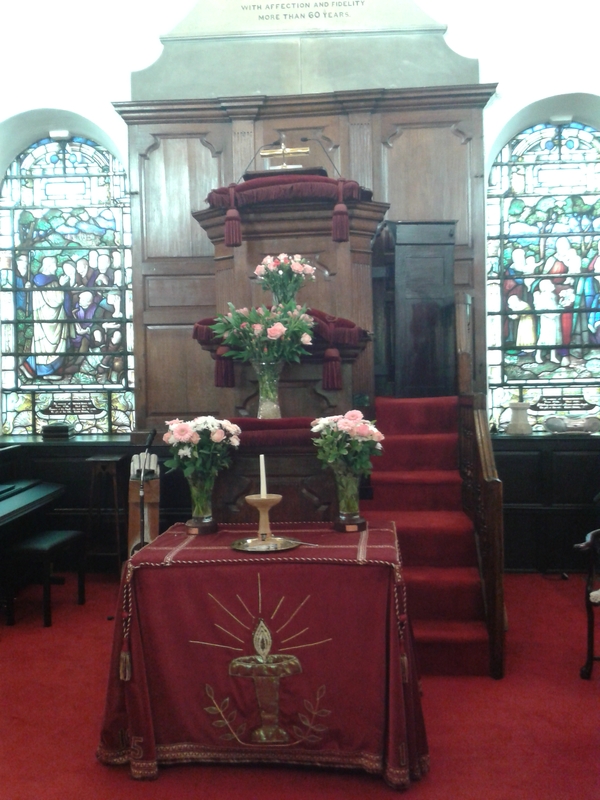 The three decker pulpit is incredibly impressive and with the traditional pulpit cushions very much looks the part still. 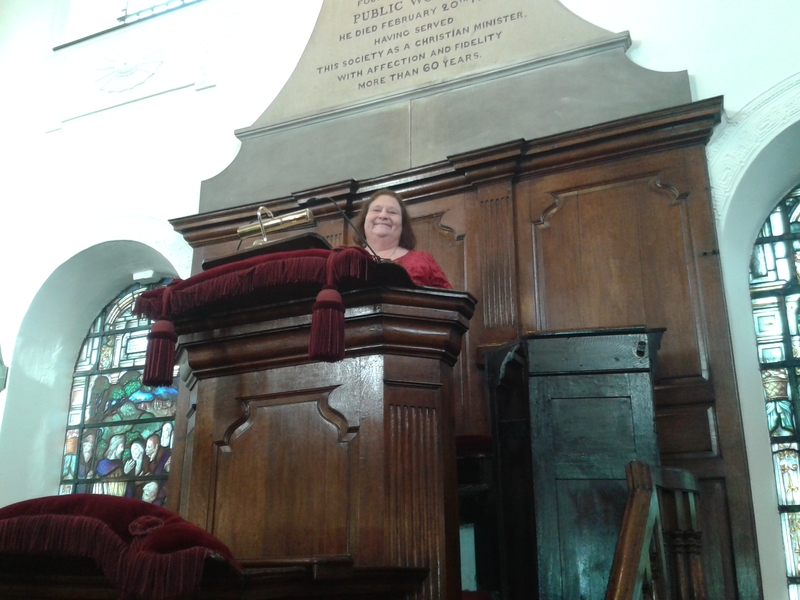 You can’t miss the pulpits and reading desk but you might miss the small section of panel cut out from behind the top pulpit. 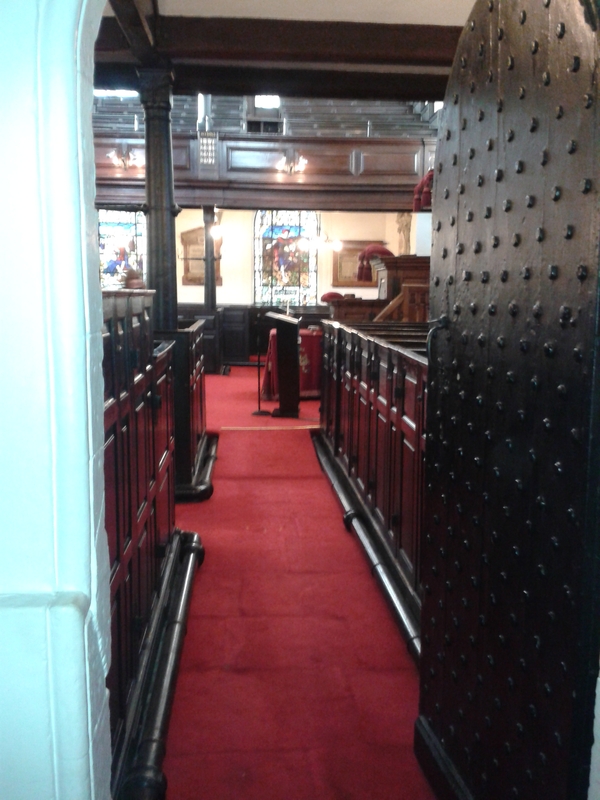 Here it was said they had to make space for the door to open wider in order to admit the well-fed frame of the Rev Thomas Belsham when he visited in the nineteenth century! It has been some years since I was last at the chapel and I had a recollection of seeing the grave of the Rev John Taylor laid flat in the grounds of the chapel. 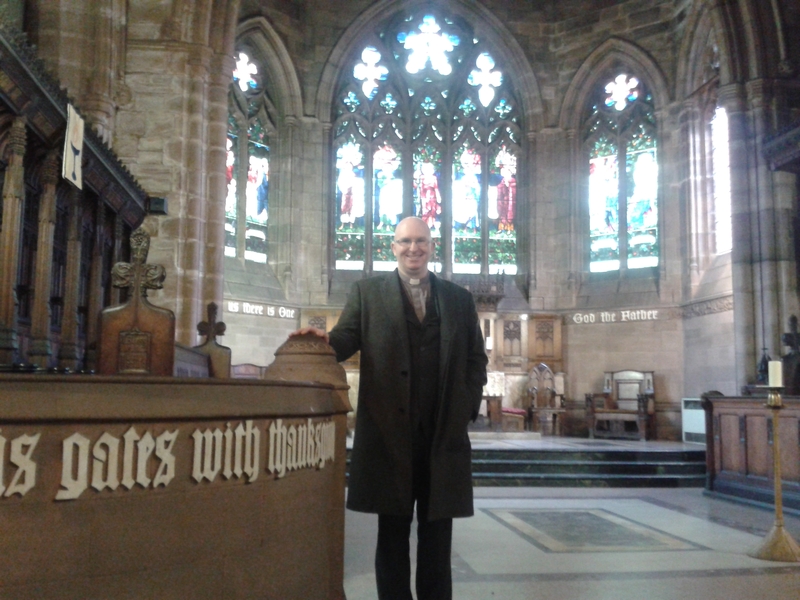 John Taylor being the first Tutor in Divinity at the Warrington Academy. 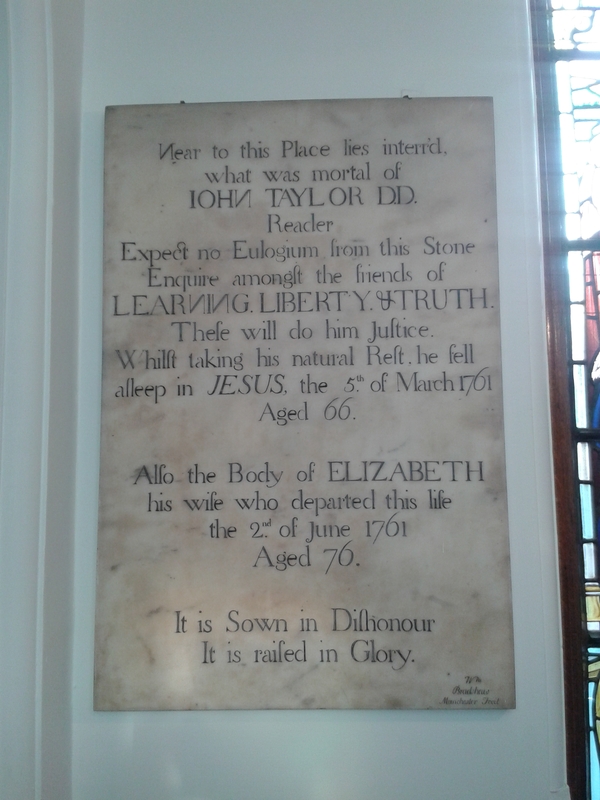 But this is not the case – John Taylor is certainly buried there but his gravestone was removed when the front of the church was extended to make way for the organ and vestibule in 1901. There is however, a touching memorial to him and his wife. The reason for my visit in January was to be part of the congregation to celebrate 25 years of ministry by the Rev Brenda Catherall and I was delighted to play a small part in that special service. Brenda has been minister there since 2007 following ministries in Bank Street, Bolton and Monton and has given 25 years of devoted service to the Unitarian ministry and touched the lives of a great many people through her outstanding work. There is something so appropriate about her ministry in the congregation in which she grew up and which has always had a special place in her affections. The chapel encapsulates the proud tradition of dissent and non-conformity in the town and it is so encouraging to see the congregation in such good heart and in such good hands.